It’s been nearly nine months since Beamer has had an update here at Rivenmaster’s Place! The reason is not because there hasn’t been anything to report. In fact, quite the opposite! This past year has been exceptionally busy for Beamer, and only recently were we able to track him down to find out what he’s been up to. This past Christmas Beamer was honored to be the sole performer on the “City of Penticton Float” for the Santa Clause parade, where he entertained the crowds with a selection of Christmas songs that he learned just for the occasion. 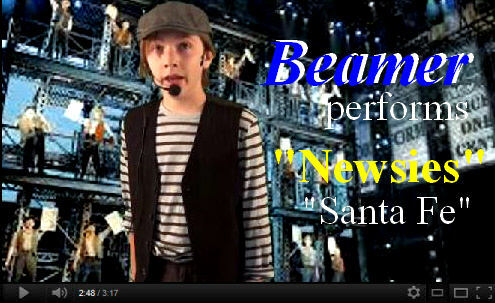 He also performed on the Disney Cruise Ship “Wonder” during his Mexican cruise. 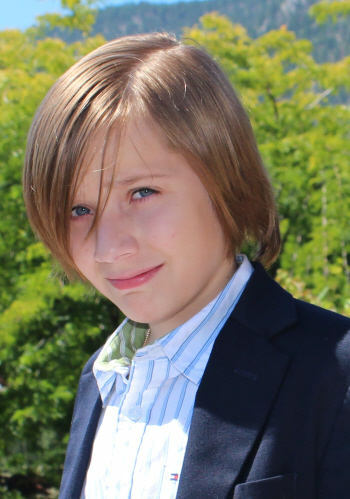 In March and for the third year, he entered into the “Our Kids Have Talent” competition in Vernon, which features young artists ages 8-18 and once again, was the youngest contestant to make it to the top 12, having received the 2nd highest mark in auditions! He performed two songs, “Viva La Vida” by Coldplay and “When I Was Your Man” by Bruno Mars. In early April, he again competed in the Kiwanis Music Festival in both ‘Classical Voice’ and ‘Musical Theatre’, in which he placed 1st in all 7 entries and won junior scholarships in both categories and two first class honours. 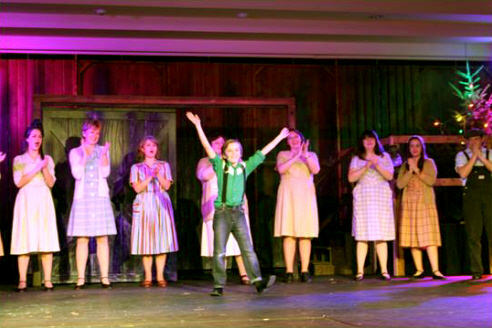 One of his musical theatre songs was “Just To Get My Name In Lights” from the musical “The Boys From Oz”. Because no filming is permitted in the actual competition Beamer made a rehearsal video to share with his fans and supporters. 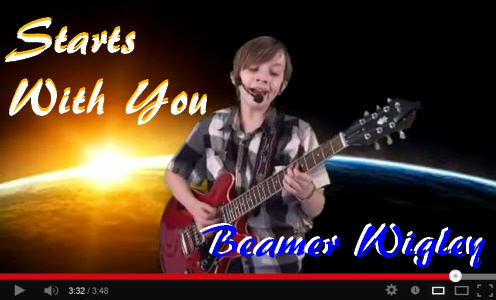 In early April, Beamer wrote a new song that he thought would be a positive message for kids wanting to make the world a better place. He entitled it, “Starts With You”. 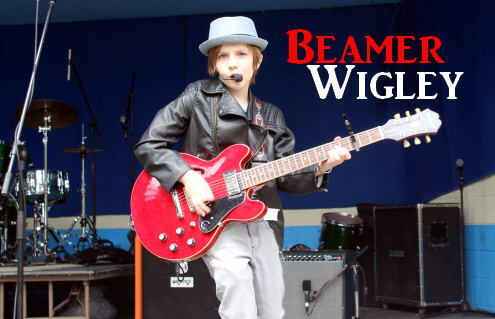 On April 14th, Beamer was the youngest to be invited to perform at OPAS (Okanagan Performing Arts Society) inaugural event, where he won a professional photo shoot. Later the same month, he embarked on his first ever tour, joining 6 other artists as they spread a positive and energetic anti-bulling message in numerous schools and red carpet evenings, through the states of Maryland, Delaware, Virginia and North Carolina. Often having two and sometimes three performances a day, Beamer learned quickly how to interact with an audience using his new wireless equipment. It was also his first time ever, working with a back track which added some extra dimension to his performances. Signing autographs soon became a regular experience, including the back of report cards, arms and even a forehead at one school! He’s not sure how the parents were going to react to that when the kids got home! But he made some good friends and plenty of fans over the 2 weeks on the road. 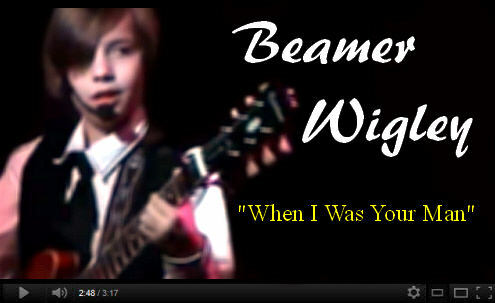 Beamer also performed a medley of songs from his Red Carpet set in New Bern, N. Carolina. In his first song, “As Long As You Love Me” by Justin Bieber, the back track was in the wrong key and it was the full version including the rap, which Beamer had never performed. Fortunately he remembered it from listening to the original song previously, and sang through the whole thing, much to the delight of the girls in the audience! When he returned home, he wrote a new song based on how he felt about his own musical passion. He entitled it “Beginning of the Road”. On May 31st, he was asked to do a full 45 minute set as part of a high school music festival project two hours from home. 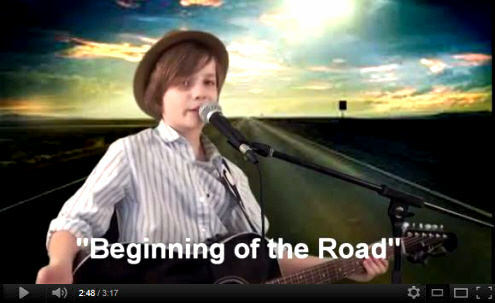 Two days later, he had accepted an invitation to perform at the Okanagan “Angel Awards Star Search”, a chartable event to benefit the ‘Juvenile Rheumatoid Arthritis Society’, featuring artists from throughout the Okanagan Valley, mostly teens and adults. Then on June 6th, he was invited to perform a half hour set at Summerlands “ActionFest”, their big summer festival. Immediately following, he went from there to a ‘Make A Wish’ charity event at a local Café, where he played another set. In both events, he performed his newest Bruno Mars cover, “Talking to The Moon”. He has really come to appreciate Bruno Mars, and enjoys playing his songs! He then made yet another trip to the U.S. in June, this time to New Jersey to perform with 3 of the other artists that he had toured with. The venue was at the Union Beach Memorial School, which had just been rebuilt after the damage it sustained during Hurricane Sandy. It was also part of a promotional video being made for an upcoming anti-bullying tour called “Stop, Think, Feel”, in which Beamer has been invited to participate. (Dates and locations have yet to be announced for this event). He was also thrilled to take the train along with the other families to New York City, where he got to visit some famous landmarks and to also see his very favorite musical, “Newsies” on Broadway. 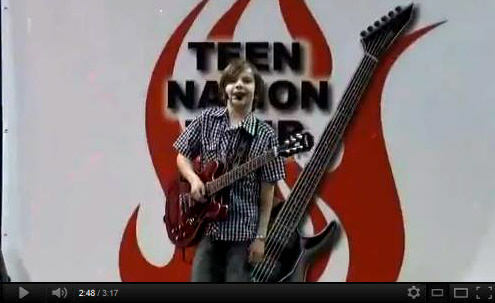 When he got home, he immediately made his own video production of one of his favorite songs from the show, “Santa Fe”. His latest performance was on Canada Day, where he was invited to play another half hour set in the city of Kelowna at their big celebration. Here he included yet another Bruno Mars song called “It Will Rain”. Now that summer is in full swing, he is involved in some of his favorite activities, including riding the family Sea-Doo with his dad, flying along zip lines and going to Rock Band School. He is also getting ready for another out of town competition that he was invited to, called ‘Dancin Barefoot in the Park’ for young artists aged 11-18. He will be doing two songs, including one for a special Elvis Presley category, where he will be performing “Blue Suede Shoes”, a song that he last played when he opened for country star Jaydee Bixby at the age of 8! He is now getting ready for his first ever trip to Nashville in early September, where he will have the opportunity to perform and meet up with some of his friends. He has always wanted to go there, so this will be a big event for him. In the meantime, he just keeps playing music and loving life. Previous Previous post: Nic Neufeld Rocketing to Success!